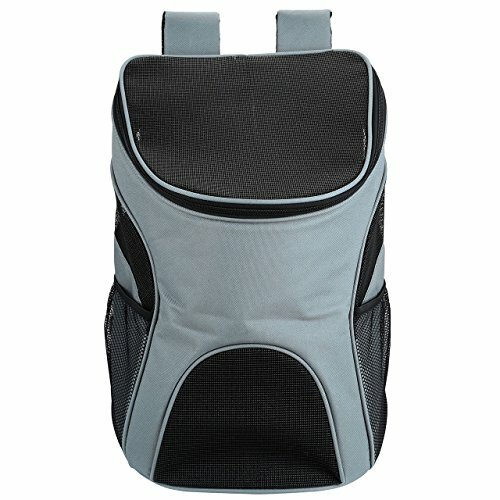 Size:M fit within 6 lbs | Color:Gray Size:M fit within 6 lbs | Color:Gray CozyCabin's Backpack is a wonderful and an essential backpack for secure pet travel, providing reliable pet safety and comfort. It is a great product that definitely worth your every penny!Our high-quality performance Backpack will keep your pup safely equipped for every new adventure! Now let's make a difference of your life for you and your pets! 1.Thick padded makes it easier to carry. 2.Large compartment store toys and food for your dog. With air mesh panels on the carrier, the dog could breath easily. 4. Removable and machine washable pad. 5.The carrier can hold dogs (Poodle, Chester, Pekingese, Pug, Doberman, Jack Russell Terrier, Scottish Terrier and other Small Dogs) and Cats. If you are satisfied with our products, please don't forget to leave Positive Feedback, we will appreciate your encourage. If you are not satisfied, before you leave the Negative/Neutral feedback, contact us and let me know that, we will resolve the problem till you satisfied.